Here is my first plot of some data on a map. 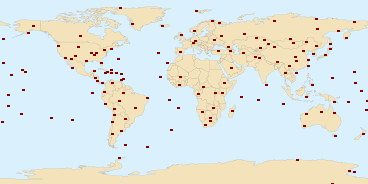 This happens to be the locations of seismic monitoring stations around the world. I used a equirectangular projection of the world map from wikipedia, which means that lat/long coordinates map easily to pixel coordinates. Also used the python csv library to read the data and the python imaging library to modify the image with red dots for monitoring station locations. This entry was posted in Maps and tagged learning, maps on October 4, 2012 by Zia.